The HLTAID004 – Provide an emergency first aid response in an education and care setting is the industry standard, Nationally Recognised (AQF) First Aid course that meets the Australian Children’s Education & Care Quality Authority (ACECQA) First Aid, anaphylaxis and asthma management training requirements of child care educators. In the Provide an Emergency First Aid Response in an Education and Care Setting course, participants learn how to manage emergency situations and provide care for patients with common illnesses and injuries including asthma and anaphylaxis. This course includes HLTAID003 – Provide first aid and HLTAID001 – Provide cardiopulmonary resuscitation units of competencies. For individuals that have never completed a HLTAID004 – Provide an emergency first aid response in an education and care setting course before or do not currently hold a current (non-expired) HLTAID004 – Provide an emergency first aid response in an education and care setting. Participants are required to complete pre-course online learning before attending the one day course, which comprises of theory and practical training with assessment. For individuals that hold a current (non-expired) HLTAID004 – Provide an emergency first aid response in an education and care setting certificate and are looking to update or ‘refresh’ it. Participants are required to attend a one day course which comprises of theory and practical training with assessment. There are no pre-course study requirements for update course participants. To apply for the Update/Refresher course – participants must hold and present a current (not expired) HLTAID004 – Provide an emergency first aid response in an education and care setting certificate (Statement of Attainment). 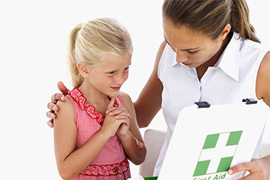 This First Aid course includes both a theoretical and practical assessment component. Theory assessment includes the completion of a multiple choice theory paper and for initial certification, the completion of a pre-course workbook. Practical Assessment includes formal assessment of practical skills including resuscitation skills. Please note all participants must be able to perform at least two minutes of uninterrupted CPR on both an infant, a child and an adult resuscitation manikin placed on the floor (6 minutes in total) to be marked as competent. On successful completion of this First Aid course, participants will be awarded the nationally accredited statement of attainment – HLTAID004 – Provide an emergency first aid response in an education and care setting through our partner RTO – Healthcorp – RTO ID 91222.